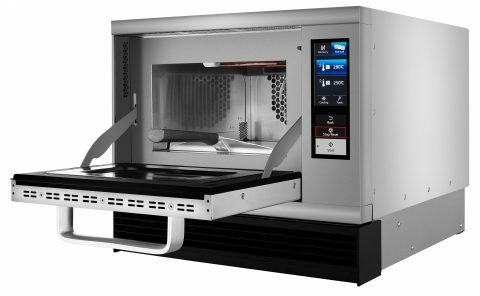 The new ideal solution to cook, toast, bake, grill and reheat a wide range of fresh or frozen foods, such as sandwiches, pastries, pizzas, vegetables and meat. Panasonic NE-SCV2 is the perfect match for anyone who wants to cook fresh and hot food, very quickly and with great results, whilst providing optimal customer service and higher satisfaction. The NE-SCV2 SD Card allows rapid menu changes and updates, for up to 999 cooking menu settings. In addition the restaurant’s own food images can be loaded on to the control panel to be used as menu buttons. Touch Display for easy and fast use. Vent-less cooking operation thanks to the built in catalytic converter. Easy-to-clean inside cavity to reduce cleaning time and simplify maintenance. Panasonic exclusive twin inverter technology, cooks food evenly with no cold spot, always providing optimum cooking results.